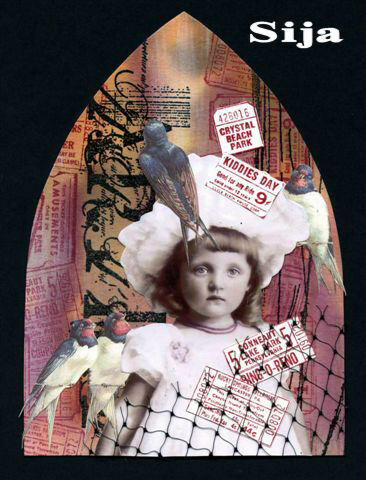 This weeks theme is “Birds” and we would love to see what you create an gothic arch form. What do you think of…a day at the park, along the ocean side, silly things birds will do? Whatever it may be we hope to see your creations posted here. I live in a small town in the Netherlands with my 2 kitties. My biggest hobby is stamping and mixed media. I love all contacts and great things we share with eachother. Blogging added a new addiction and every week it’s exciting where to play. Ik woon in een kleine stad in Nederland met mijn 2 katten. Mijn grootste hobby is stempelen en mixed media. Ik geniet van alle contacten en mooie dingen die we uitwisselen. Door het bloggen is er ook zeker een dimensie bijgekomen en is het elke week weer spannend om aan een uitdaging mee te kunnen doen. I can’t believe I am the first with this challenge. I was just about to start this card when I read your birds posting. How strange is that! So I am really pleased with this challenge thank you team, and I got a three in one. This is a wonderful Theme. Here is my arch for this week. Thanks for looking. First time I participate, here is my entry for this week. I’m proud to pick the theme for this week. Thanks Nancy! Here is my link to my arch. Im curious what you all make. What a wonderful arch! I love the bird theme. Here is my entery for this week’s challenge. What a wonderful theme! I’m so glad I finally found the time to participate. My entry is “Pretty Bird”. Thanks for a reason to get my new plate of stamps cut up and inked up!!! Here’s my entry – thanks to Cora for the image. This is my first entry this week. I really admire these arches. My “Birds” arch-thanks for looking!! Hi! Here’s my entry for this week. I tried something different this week. A wonderfull theme, this is my entry. Having been away in China – I have had to cheat & combine 2 week’s topics together this week………so I have a ‘spooky arch’ with a ‘bird’ on it!! LOL!!! I am hoping to make something a bit ‘prettier’ later in the week – but here it is! Voici ma participation à votre challenge. OK – I’ve managed it – footnote to my previous entry – here is my REAL ‘bird’ arch for this week. Here is my entry thanks!!!!!! Here is my entry thanks!!!!! I didn’t think I was gonna have time this week but have just managed to sneak one in again!